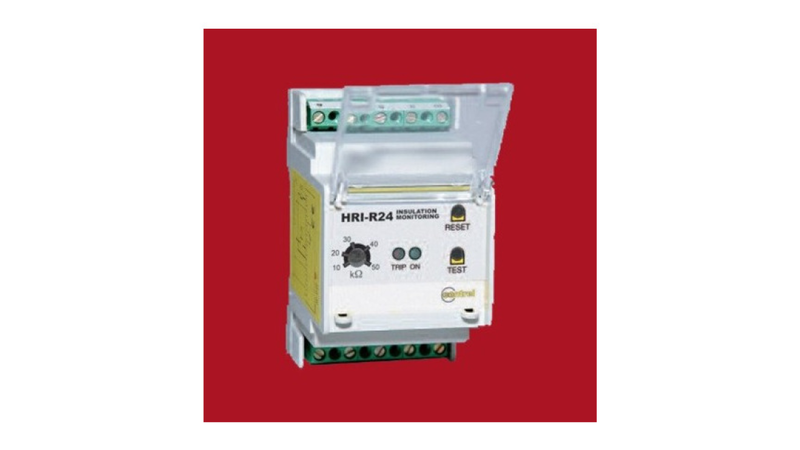 HRI-R24 tests the earth insulation of 24 V a.c./d.c. circuits and is particularly suitable for medic allocations (IT-M systems) in which both 24 V and 230 V lines are present; in these environments, it is important to have a permanent control of the low voltage line as, in the event of a fault or short-circuit, this line could transfer a potential of over 250 V with consequent damage to equipment and people.HRI-R24 measures the variation in potential of the two network polarities with reference to earth in order to signal when insulation drops below a set value, identifying thefaulty pole in direct current. The output signal can be connected to the remote signalling panel PR, to be installed in the rooms powered by the controlled line. The alarm threshold can be adjusted using microswitches.